Lennox has a really great smart thermostat, called iComfort. iComfort is a touchscreen unit like the ecobee3, but the interface is much different. The touchscreen is wider than the ecobee3, and looks almost like an iPad mini or similar tablet. Credit: Image courtesy of Lennox International, Inc. Remotely control your home’s temperature using the iComfort app for iOS or Android, or log onto MyiComfort and make settings adjustments via the web. One-Touch Away mode puts your system into a deep sleep, so no energy is needlessly spent heating or cooling your home while you aren’t there. 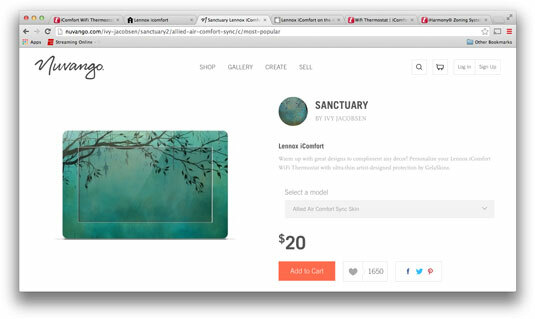 The touchscreen interface works very much like your iOS or Android device. 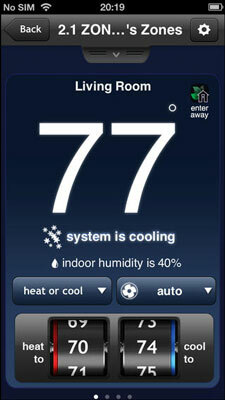 Weather-on-Demand gives you a five-day forecast right on the thermostat. Whenever there’s a problem, your iComfort will alert you via email, text, or through your mobile app. It can even contact your local Lennox dealer directly if you allow it to. While Lennox would prefer you only use its thermostat with its HVAC units, have no fear that your non-Lennox system won’t work with the iComfort. 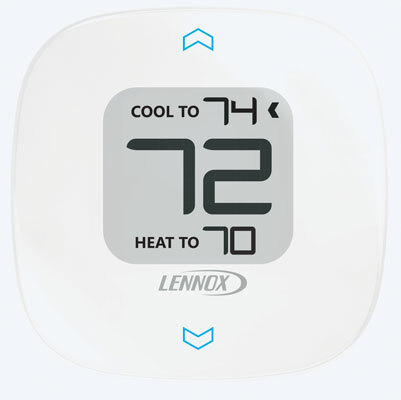 Lennox does say that you’ll have a better experience with the overall system if you use only its premium products. Don’t think the default look of the Lennox will do it for you? Rest easy, gentle reader, Lennox has your back. Nuvango covers are available for your iComfort, and they give you the customizable look you want. The Nuvango covers fit around the outside edges of your iComfort and meet at the edges of your touchscreen. When the screen saver kicks in on the iComfort, it matches the pattern of your edge cover. There is one major chink in the armor of the iComfort, and that’s its installation. Actually, it’s the fact that Lennox doesn’t give you the option to install it yourself; the iComfort is installable only by a Lennox dealer. Even if you just want to check compatibility of your current HVAC units with iComfort, Lennox still pushes you to a dealer. The iHarmony Zoning System is a great option for your home’s HVAC system that allows you to heat or cool specific rooms or areas of your home by zoning off certain areas with their own thermostats. These separate thermostats enable you to set custom temps for zoned areas: That’s right, these areas are heated or cooled strictly to your specifications. 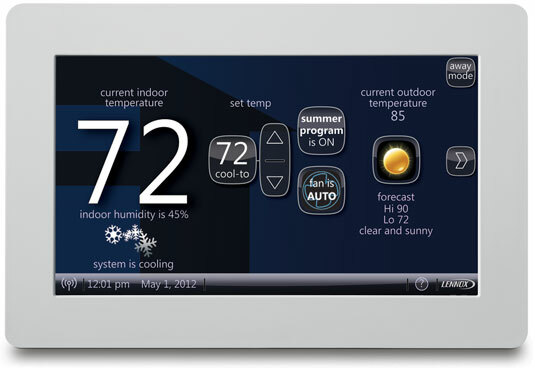 iHarmony works in conjunction with your iComfort thermostat. Whenever you make a settings change to one of the iHarmony thermostats, zone dampers (which are basically flaps or valves) in your HVAC system’s ductwork open or close as needed to direct airflow to precisely the room that needs it. It’s a nice feature that certainly ups the Awesome Factor for the iComfort system.